This New Zealand made range features all steel construction with a fully powdercoated scratch resistant finish. Standard options allow for hanging garments or folded garments, and include 6, 8 and 16 door options in a single unit. All feature a master door or master key option to allow for items or uniforms to be distributed en masse. Two standard soiled garment lockers provide for the return and easy collection of used items for cleaning. 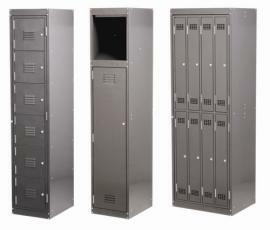 Lockers can be banked together to provide clean lines and streamlined appearance. Ventilation slots or holes in all doors as standard. Sloping tops, plinths and seating benches are available. Doors can be left or right hinged. Custom variants available on application.